Not so long ago we discovered the online music recommendation site last.fm had introduced the ability to create "groups", or areas on the site for like minded individuals to share musical tastes and ideas. Given that we're prone to signing up to anything with a login button, we created a Sidepodcast Music Group, admittedly with no real clue as to what use it might serve. Quickly however, this proved to be something of a special idea. In essence, anyone with a last.fm account can join the group which allows you to take part in audio related discussions and to see what other Sidepodcast listeners are enjoying at any particular moment in time. 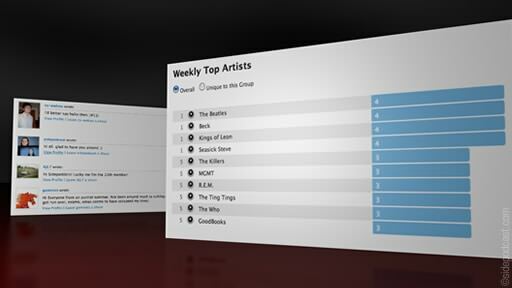 That's all well and good, but the really cool feature the group offers is that any songs you listen to get added to the weekly Sidepodchart - calculated every Sunday, as all good music charts should be. Having a chart gives us a good idea of what tracks people who listen and contribute to the show also consume, as well as highlighting those who actually have some taste when it comes to music. There are currently 18 members in the group, including ourselves, and after about three weeks The Beatles top the chart which also features, Beck, Kings of Leon and The Ting Tings. Wonderful stuff but clearly none of those are our doing. If you're interested in seeing what the F1 community listens to, check out the Sidepodcast group, and why not sign up while you're there?